With traditional revenues under pressure and mobile data use soaring, operators have been forced to evolve both their networks and their business models. Some have been more successful than others. 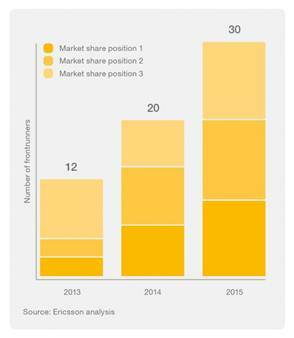 A study from Ericsson (NASDAQ: ERIC), in collaboration with Ernst and Young, has identified and classified these operators as Frontrunners. Between 2010 and 2014, Frontrunners enjoyed a 9.6 percent CAGR while competitors in their markets achieved only 2.7 percent. 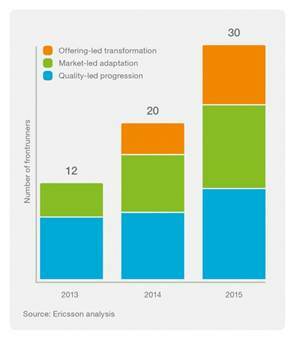 In undertaking this research, the results of which are launched today, Ericsson has identified three distinct strategies adopted by Frontrunners. Significantly, what is good for the end user is also good for the operator. The study also revealed a number of ways in which Frontrunners are similar including their views on connectivity and services as differentiators rather than commodities, and their focus on innovating new revenue streams rather than maximizing old ones. Frontrunners display greater interaction between marketing and technical roles, rather than the traditional silos, and they leverage network performance by either utilizing superior network performance as a differentiator or by improving network performance to meet customer expectations. Martin Sebelius, Executive Director of Nordic Advisory, EY, says: "We clearly see that despite their different strategies, frontrunner operators share a common commitment to network quality. Not surprisingly, Frontrunners constantly seek new ways of challenging industry conventions to make connectivity more relevant to people, business and society." Stéphane Téral, Research Director, Mobile Infrastructure and Carrier Economics, Infonetics Research, now part of IHS Inc., says: "This is a well-reasoned study that helps operators in different markets answer the universal question of where to invest and generate returns. Operators are trying to keep up with the growth in data traffic while facing significant economic conditions, including flat-to-declining revenue in often saturated markets. As it provides a nuanced view drawing on a global scope, this study is exactly what is needed for operators to thrive in any market condition. "In addition, mobile consumers are very savvy today and understanding what makes operators tick can help them make better decisions as to where to lock in their subscriptions -- I think this study could be as interesting to consumers as it is to operators," Téral says. Patrik Cerwall, Head of Radio Strategic and Tactical Marketing, Ericsson, says: "We wanted to understand what makes operators successful in order to be the best partner to our customers. It may sound self-serving, but Frontrunners focus on growth, both enhancing the core business while at the same time exploring new markets and capabilities to secure future revenues, such as IoT (Internet of Things) and vertical solutions. "The journey toward 5G in 2020 will be marked by both new technology advances and new business models, but that transformation really started with the shift from voice to data-driven networking. The operators who are managing that transition successfully may provide the blueprint for success in 5G," Cerwall says. Understanding these strategies can help more operators become Frontrunners. This may have a beneficial effect for all operators, as it appears that the presence of a Frontrunner in any given market benefits all operators in that market: peers of operators in markets with Frontrunners are growing at 2.7 percent while markets without Frontrunners have negative growth of 1.4 percent. In 2013, most of the 12 identified Frontrunners were associated with the Quality-led strategy, leveraging their size and assets to deliver superior quality, and thereby achieve profitable growth. Market-ledoperators were in the minority and Offering-led operators had not yet joined the Frontrunner ranks. In 2014, the number of Frontrunners increased to around 20 and included Offering-led operators. By 2015, it is projected that there will be 30 or more Frontrunners, with distribution between strategies starting to even out. It is important to recognize that Frontrunners are not necessary market share leaders in their respective regions. In fact, in 2013, most Frontrunners were #3 by market position. By 2015, it is projected that this, too, will even out with Frontrunners having representation across the top three market share positions.